Home / Creativity / Never Stop Learning! I recently made a trip from North Carolina to New York City for a weekend Soap Intensive. This was a fantastic event to learn something new, namely making soap cupcakes and soap bon bons which I have been wanting to learn how to do for awhile. We also dabbled in using beer and wine to make soap and also some advanced coloring techniques. All in all it was a great time and networking with other soapmakers was as they say, priceless. The great weekend of classes was put together by Amanda Griffin of Lovin Soap and Holly Port of Lotion Bar Café . 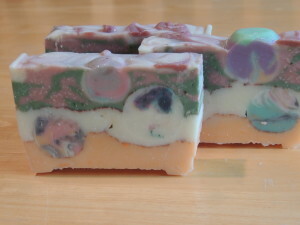 I have been making soap since 1998 and selling it since 1999 and one may ask why I would be taking a soap class since I also teach soapmaking myself? I had some goals in mind for some cupcakes soaps I wanted to try and other new things that popped up over the weekend. I was wide open to new things and soaked it all up. You never know what will happen when you put yourself in a new situation and in a learning mode and where it will lead you! I am turning 64 this year and never want to stop learning! I went to night school in 2002 to become a massage therapist. I was the oldest student in the class at 53 and it was an awesome experience. I finished the program, got my license in 2004 and practiced until 2008. I am still very passionate about this therapy and people at work will ask for me to help with cricks in their neck and shoulders. Even though at this point I am not practicing, the learning was the prize for me. I feel that learning something new everyday feeds my mind and my soul and keeps me on my path for who I am. Learning excites me with new possibilities and new things to try! What have your been learning today or wanting to try ? This was my soap from the embed class- it was allot of fun to make the soap balls! What a wonderful message! After a year long recovery (blog on that April 12! ), I am taking on the world and projects I have piled up. Learning along the way has been inspiring. Finding ones passion(s) can sometimes feel like an uphill battle, but why not embrace there here and now and “just do it”! Love they way you have done that with your various interests. I know some people wonder why I travel so far but the learning and the people you meet make all worth it. Never too old to start something new as the next year you will be another year older anyway so why not put those 365 days to good use! :o) Have a great day! Well, first of all, greetings from some fellow Carolinians… (Tammie is in NC, I am in SC). Your soap looks like great art as well as something practical! I think no matter what we do (work or pleasure) there is always room to learn and expand. To me learning something new is fun and often a way to meet new people and network. Sounds like you found the trip very worthwhile! Those are some very cute soaps. I think your not living if your not learning something or refreshing your mind on something. Great inspiartion to read for sure. I found you on the UBC. Hope your month is full of new learning experiences that you’ll share with us! Sounds like you had a wonderful time. I’m so glad you are following your passion for learning. Love the colors in the soap. That is so sweet! You were such a pleasure to teach and get to know .I love that soapmaking brings New friends your way! <3 Can not wait to see what you create! Thanks for being a great teacher! I am planning on making my first batch of soap cupcakes this weekend- wish me luck and I will post the results! Have a great day! I’m so glad you enjoyed the classes, Marilyn! It was great to finally meet you in person. Hope to see you in Raleigh in May? Love this! We need to keep learning to keep our minds active. Our mind is like a muscle and if you don’t use it, you lose it. Thanks a lot for the article post.Truly thank you! Want more.